Theresa May returns to her office in London. A second Brexit referendum would do "irreparable damage" to politics and "break faith" with the British people, Prime Minister Theresa May will say on Monday, rejecting what some see as the only way to break an impasse. 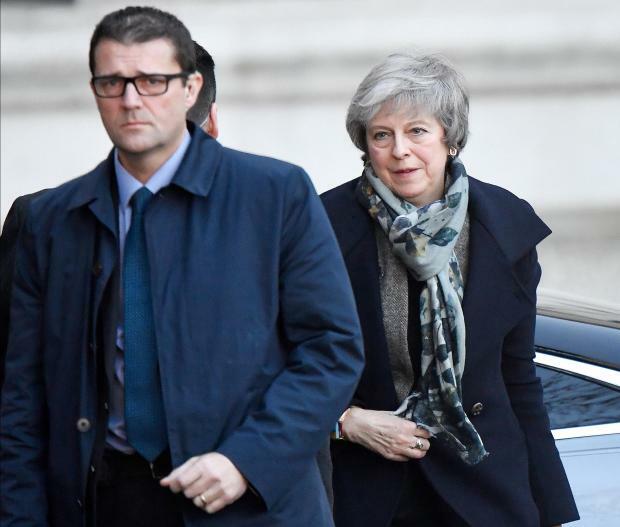 After a tumultuous week in which she survived a confidence vote and sought last-minute changes to a Brexit agreement reached with Brussels last month, May faces deadlock over her deal in the deeply divided British parliament. With the European Union offering little in the way of concessions to win lawmakers over, an increasing number of politicians are calling for a second referendum. But May and her ministers have repeatedly ruled out a new ballot, saying it would deepen divisions over Britain's biggest decision since World War Two and betray voters who narrowly backed leaving the EU at a 2016 referendum. That increases the risk of Britain leaving without a deal in less than four months, a scenario some businesses fear would be catastrophic for the world's fifth largest economy. The political and economic uncertainty over Brexit is having an impact, with data on Monday showing a drop in consumer spending, falling house prices and growing pessimism in household finances. "Let us not break faith with the British people by trying to stage another referendum," May will tell lawmakers, according to extracts of her statement released in advance. "Another vote which would do irreparable damage to the integrity of our politics, because it would say to millions who trusted in democracy, that our democracy does not deliver. Another vote which would likely leave us no further forward than the last," she will say. Business minister Greg Clark said a second vote would only increase uncertainty for the country. May returns to parliament to update lawmakers on Brexit after a week in which she cancelled a vote on her deal because it was set to be defeated and survived an attempt by some of her own lawmakers to oust her. The Labour Party, which is under pressure from smaller opposition parties to propose a motion of no confidence against the government this week, said on Sunday it would seek to force May to bring the deal back to parliament for a vote before Christmas. May used a visit to Brussels last week to call on EU leaders to offer assurances over the so-called Northern Irish "backstop" - an insurance policy to prevent the return of a hard border between the British province and EU-member Ireland that its critics fear will tie Britain to the bloc in the long term. But while EU leaders said they were willing to help May, they warned the British prime minister she could not renegotiate the deal, agreed earlier this year.